Q: I am getting a lot of pain from my hip to the outside of my knee which increases particularly with running. What is happening and what can I do? A: A common running injury that affects this area is called ITB Syndrome (or Iliotibial Band Syndrome). This typically occurs with long distance runners and is usually an overuse issue. The IT Band is a thick band of connective fibrous tissue extending from the pelvic bone to the outside aspect of the knee. When it becomes tight it can rub over the bony outside portion of the knee. This friction and/or compression causes inflammation of the underlying bursa tissue, leading to lateral knee pain. This pain can become debilitating and affect new or seasoned runners, potentially sidelining them for weeks. There are several causes of IT band syndrome. Many times it can be from street running in the same direction due to the slope of the road, running excessive miles, running downhill with constant pounding, and improper footwear. Other anatomical factors contributing to ITBS could be a weakness in the hip musculature and postural deviations such as high arches. To treat ITB Syndrome, it is optimal to rest the area by reducing or stopping mileage, but maintaining active with cross-training exercises such as swimming, cycling, or rowing. Stretching and strengthening of the proper muscles, especially surrounding the hip [where the IT Band originates], is a crucial portion of the rehabilitation. Physical therapy will help by providing proper instruction in these exercises, as well as; soft tissue mobilization, ice, heat, ultrasound, electrical stimulation, iontophoresis, and taping. Once the inflammation has decreased and pain eliminated, a gradual return to running program can be initiated. A physical therapist can evaluate, diagnose, and treat this syndrome as well as most running injuries. 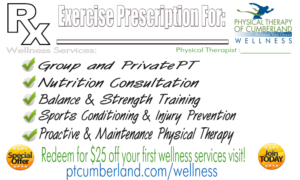 If you would like any additional information, please feel free to contact Physical Therapy of Cumberland at 401-333-9787 to speak with one of our experienced therapists.